This delicious and lightened up creamy chicken, broccoli, and rice divan can all be made in one pot and in under 30 minutes. It’s filled with flavor and keeps the ingredients to a minimum! I’ll let you all know the results when it’s all finished up. But for now, I’ve got some more yummy one-pot goodness. Plus I healthified it a bit – a lightened up creamy chicken, broccoli, and rice divan in one pot and thirty minutes. Oh yeah! This dish makes chicken, veggies, and rice pretty much the easiest combo ever. No more messy-ing up all the pots in the kitchen. You know how that goes – one for the rice, one for the chicken, one for the veggies. And one more for who knows what. Just good measure I suppose. And then you eat dinner, but it’s just not that awesome, because the sink is glaring down at you with a hundred and five dishes (Yeah, the 4 just went to 105 somehow). Not any more though. Because the chicken, rice, and vegetables are all in one pot. And it’s SO STINKIN’ easy! Plus if you get pre-cut broccoli, you really don’t have much to do preparation wise. Just let your stovetop do it’s magic. When I eat creamy chicken, I like the chicken shredded. Chicken chunks are fine, but to me, the shredded chicken soaks in all the good cream and flavors! So I start this meal by boiling the chicken breasts in chicken broth. A couple notes here – I like to boil the chicken in chicken broth (SO much more flavor). I usually just buy chicken bouillon cubes or powder and add them to boiling water and then put the chicken in. If you want to start with rotisserie chicken, that would work great too (more flavor even) and you skip a step of boiling the chicken. Take the boneless skinless chicken breasts and cut them into about 2-inch pieces. Then it will take about 10 minutes to have them boiled and cooked all the way through. Once the chicken is boiled, drain it and quickly shred it with two forks in the pot (or remove the chicken to a plate if that’s easier). Then the chicken, white rice (brown takes too long, so you would have to cook brown separately if desired), and broccoli gets put in with some chicken broth. I like to mix the chicken, rice, and chicken broth together and then put the broccoli on top of everything. This gives the broccoli more of a steamed flavor and texture. Bring the mixture to a boil and then reduce the heat to medium low (halfway between the low and medium) and cover with a lid. Since everyone’s stoves cook at different temperature you’ll want to watch this a bit. It takes my stove anywhere around 10-12 minutes for the rice to be cooked and the liquid all drained out. However, if it’s not cooking quick enough, you may need to increase the temperature a little and if it’s cooking too fast (the rice is still crunchy), you’ll want to add a bit more chicken broth. Once all the liquid is absorbed, there are just a few ingredients to stir in. Some cream of chicken, sour cream, mayo, salt and pepper (I lurve me some seasonsed salt in this dish), lemon juice, and curry powder if desired. I used fat free versions of the sour cream, mayo, and cream of chicken and didn’t notice any flavor missing. 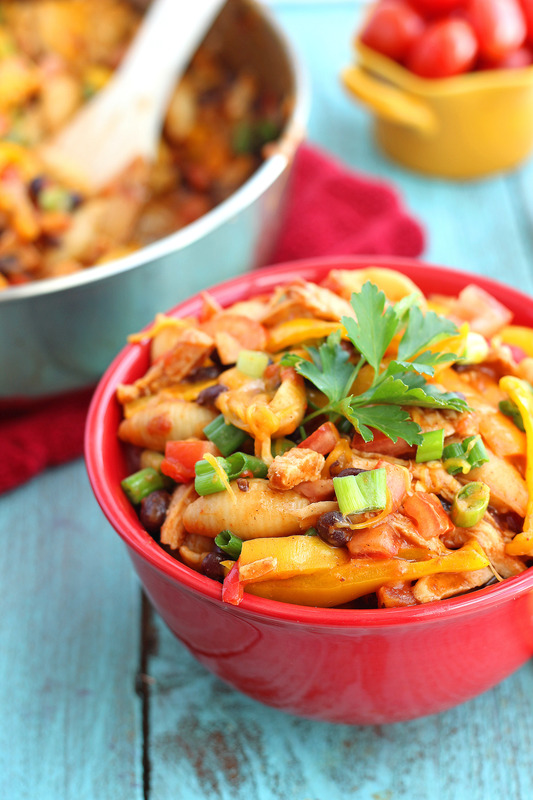 It’s a great way to cook healthier and cut some calories from the meal. But if you are looking for full-fat and flavor, don’t worry about using fat-free versions. My family loved the simplicity of this meal – just a regular chicken, broccoli, and rice casserole. But if you are wanting more spice in yours feel free to add in some garlic powder, onion powder, poultry seasoning — whatever you like! Remove any fat from the chicken breasts and cut them into 2 inch pieces. Place the chicken pieces in the boiling water and cover the pot. Allow to boil for about 10 minutes or until the chicken is all the way cooked through. Drain water from the chicken and shred it with 2 forks. Bring the mixture to a boil on high heat and then reduce the heat to medium low and cover with a lid. Everyone's stove is going to cook a little differently so watch yours. If the rice isn't cooking quick enough, maybe increase the heat a little and if the water is evaporating before the rice is cooked, add a little more chicken broth or water. Mine takes right around 10-12 minutes when I make this meal. When all the liquid has been absorbed in the rice and broccoli, turn off the heat. Stir in the lemon juice, mayo, cream of chicken, and sour cream. Add in the seasoned salt or curry powder to your taste preference. If you don't like curry powder don't add it in, if you do add it in and even increase the amount if desired. Top each bowl with a handful of freshly grated Parmesan cheese. We've also tried this with cheddar cheese and that is great too! Typical chicken divan has a bread crumb (or Ritz cracker) topping. Feel free to crush up some crackers or mix some bread crumbs with a few tablespoons of melted butter and top your dishes with it. Chicken, broccoli, rice is one of our favorite meals. Your version looks amazing! Can’t go wrong with a great meal in under 30 minutes. Woot! This recipe is right up my alley- simple, quick, and oh so delicious. Happy Sunday, Chelsea! Mmm, all my boys would love this! Too funny about your mom taking the survey. Mine would probably say something similar! I LOVE chicken divan! It reminds me of when I was little and my mom would make it. So this is going on in our kitchen soon! 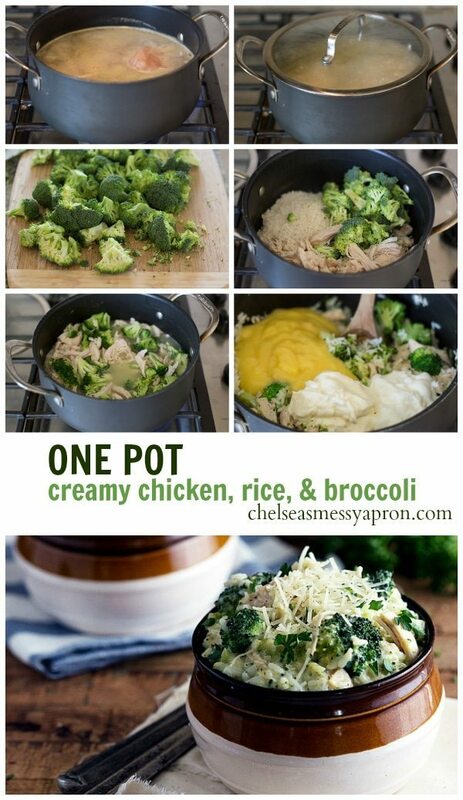 LOVE this simple one pot meal, Chelsea! I love your one pot meals, Chelsea! Not only are they super easy to prepare, but everything looks so delicious! This creamy chicken with broccoli dish looks amazing. Definitely something that my husband would love, too. Pinned! Pretty sure you are the queen of one pot meals girlfriend!! I Love Chicken Divan – thanks for reminding me about its yummy existence! Pinned! Gee I always use red rice, but since I cook it in my rice cooker, I don’t have the instructions. Wonder if the 1 cup rice to 3 cups liquid would work for that, do you know, have you ever used red rice. Sorry, I’ve never used red rice with this recipe, so I can’t say for sure. However, red rice is more like brown rice than white rice, so I don’t think it would cook in the same time as white in this dish. This is fantastic, Chelsea! You had me at the whole not having to wash a gazillion dishes thing. I love everything about this recipe! Pinned! Mmmm this looks so comforting!! And delicious! And one pot is always a good thing! Hope you had a fantastic weekend!! 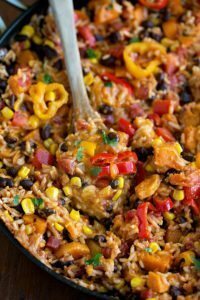 One pot—under 30 minutes—-with ingredients I normally have on hand—-and DELICIOUS. Works for me. 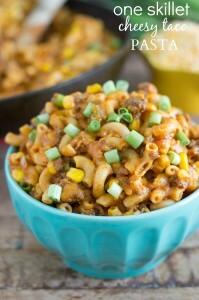 This looks like the kind of comfort food I love! Can’t wait to try it! All these favorite flavors in one pot? I’m sold! Can’t wait to whip this up! Now this is my kind of recipe! 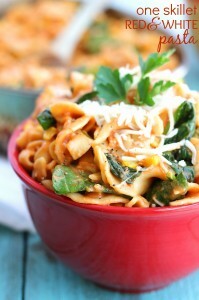 I love one pot meals as they are super simple and they make great weeknight meals. I definitely will be recreating this Chicken & Rice Divan Chelsea, it looks totally delicious and I love how quick it is to whip up. You are so kind!! Thank you Sarah 🙂 It means a lot to me! Cooking this tonight for dinner! Thank you so much for this recipe!! !